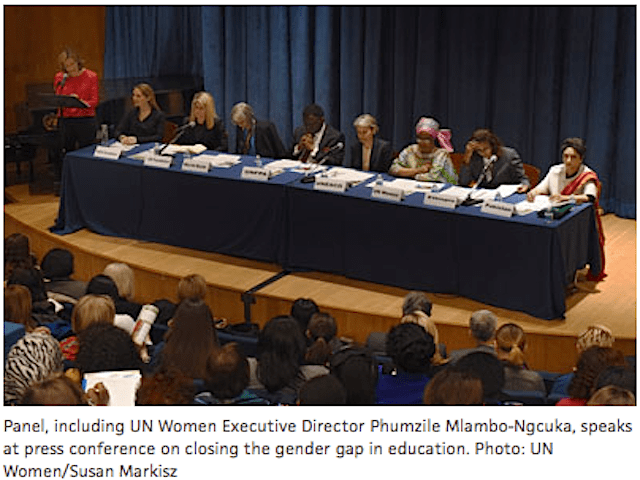 Empowering adolescent girls and young women through education is the aim – and the name – of a programme launched in New York today by UNESCO, UN Women, the UN Population Fund (UNFPA) and the World Bank. Announced by UNESCO Director-General Irina Bokova, UN Women Executive Director Phumzile Mlambo-Ngcuka and UNFPA Executive Director Dr. Babatunde Osotimehin during the 59th session of the Commission on the Status of Women at United Nations Headquarters in New York, the new programme provides a coordinated and collaborative effort to close the persistent gender gap in education and accelerate development. UNESCO’s statistics show that of the 57 million out-of-school primary children around the world, 31 million are girls, and the number is higher still for secondary. Similarly, two thirds or 493 million of the world’s adult illiterate population are women. “We must ensure that every door to the education of girls and women remains open across the life cycle; that girls and women who drop out of education have second chances; that they have the relevant skills to transition to productive lives and full citizenship; and that the empowerment of girls and women becomes an inseparable part of the return on our investments in education,” said Phumzile Mlambo-Ngcuka, Executive Director of UN Women. The joint programme will be rolled out gradually in 20 countries where the education gender gap is most critical, starting with Mali, Nepal, Niger, Pakistan, South Sudan and the United Republic of Tanzania. It will concentrate on four areas: improving quality and relevance of education; raising awareness at all levels to create a favourable environment for gender equality; strengthening links between the health and education sectors; and improving the data base of statistics on gender and education. It will also harness the potential of information and communication technologies to improve education delivery and content and encourage their further application for income generation, lifelong learning and exercising citizenship. The new programme falls under the framework of the Global Partnership for Girls and Women’s Education, launched by UNESCO in 2011, and is guided by the conviction that educating girls and women can break the cycle of poverty and foster greater social justice, economic development and sustainable peace.